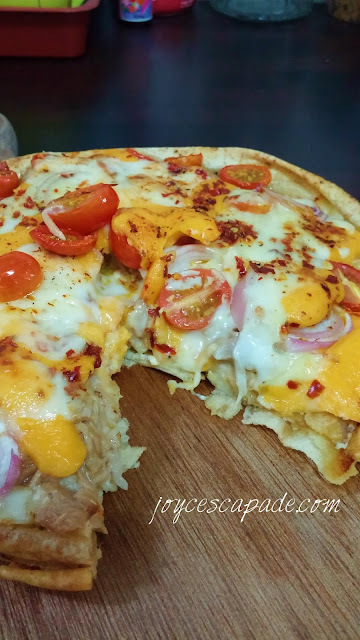 Toddler-approved Tuna, Cherry Tomatoes, Red Onion "Pizza"
Tuna, Cherry Tomatoes, Red Onion "Pizza"
This "pizza" is toddler-approved! Why did I say "pizza"? That's because I didn't use a pizza dough as the base. I don't fancy making my own pizza dough and store-bought frozen doughs are expensive and most likely, unhealthy. So, I used Lebanese flatbread. Hehe. You can easily buy Lebanese flatbread from hypermarkets. They are usually sold at the wraps/pita bread section. 2. Spread some cream cheese on the first flatbread. Lay the second flatbread on top and press lightly until both pieces stick together. Continue spreading cream cheese on top of the second flatbread. 3. Drain half of the oil from the tuna can and spread the tuna flakes evenly on the top of the flatbread, followed by red onions, and tomatoes. 4. Top with all three types of cheeses, sprinkle with chili flakes and ground black pepper. 5. Bake in the preheated oven for about 25-30 minutes. Let cool for about 10 minutes before serving immediately. Let's tear it up and eat! 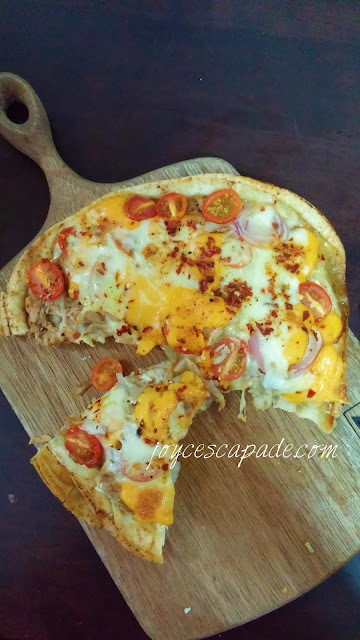 This tuna-tomato-onion-cheese combo is great! The edges of the flatbread are crunchy. Overall, it's like eating a thin crust pizza. My 31.5-month toddler eats the tuna and cheesy bits enthusiastically, including the crunchy edges. So there you go! My toddler-approved "pizza"! Oooo..this looks yummy..Oh! I have a mommy-blogger friend...I shall ask her to check you out as well.. I'm sure my kids would love this pizza.. Looks so yummy! Mmmmm...Looks like a simple yummy recipe to try over the weekend! You punya recipe memang best ! My children love to eat pizza. I will try out your recipe and hope it works on me. wow looks so good! definitely something i want to have. Looks yummy! I love to eat onion and cheese! Wow! 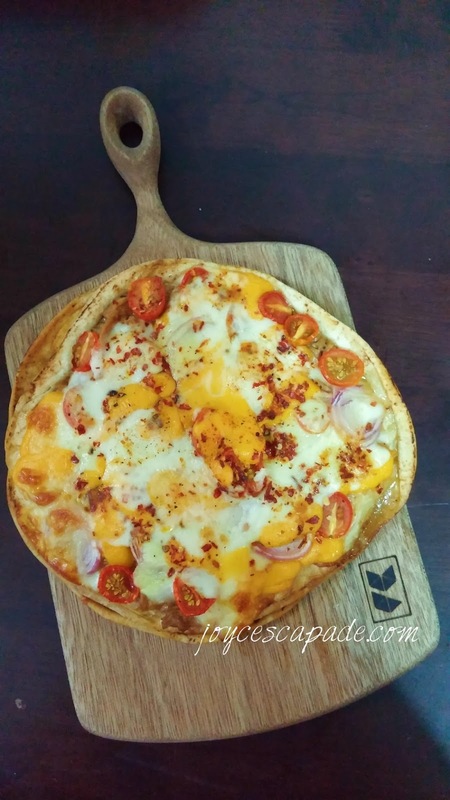 Baking pizza by using flatbread? Looks like something interesting to explore more! wow this is really good. agreed with you that flat bread is a good pizza base! and it's easy and convenient to make too! so cute, toddler approved pizza. :D.. thanks for sharing this recipe. I too love baking and cooking with my kids, it is so much fun doing with them. 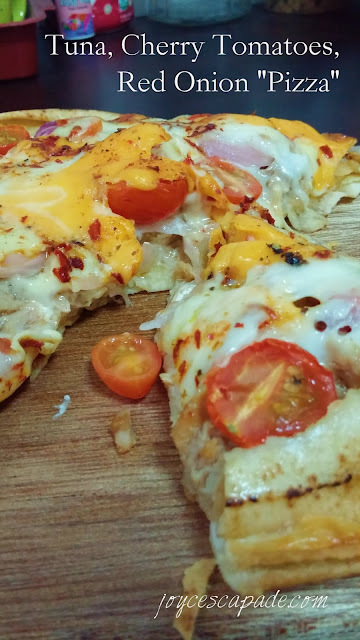 I like this simple and healthy pizza, can easily cook it at home. You make me hungry to the most! OMG! 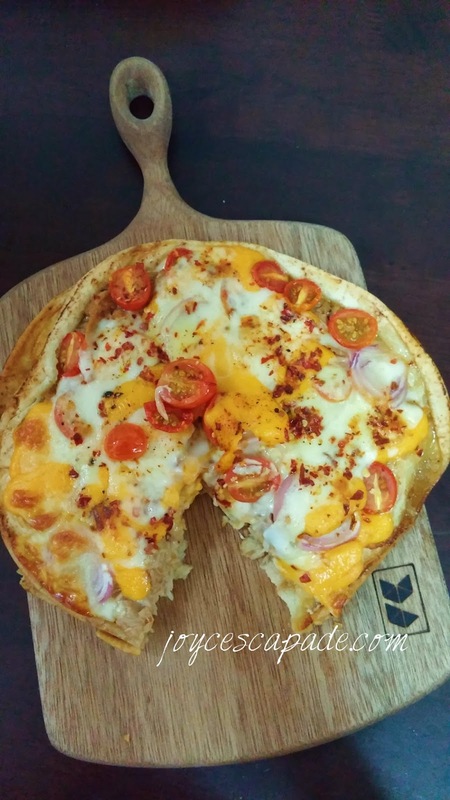 This is a smart idea to use Lebanese Flatbread to do a pizza. Is seem yummy to me. I believe not only toddler like it but the adult also love it.